As a part of The British Library’s historic Sacred exhibition (the world’s greatest collection of Jewish, Christian and Islamic scriptures), I was asked to present a contemporary art show in the spirit of the exhibition, to be called Sacred on Location. It was my husband Marton, a great collector of Judaica, who walked into one of his customary antique dealers and fell on a ‘irresistible’ rubble like heap of wooden Hebrew printing blocks, which he discovered were from 19th century Vilnius. As he was not sure how I would respond to this particular find, he left them for some time in the car boot. But when I fell one day on the contents of that plastic bag, my heart begun pounding aloud. The loose ancient letters which printed once the prayer books of old, set my imagination alight. When I touched a letter I felt as if I were touching a human soul. Working with the very finest paint brushes, I sat for a week cleaning my holy souls (letters) from old ink and more recent sticky dust. Then I researched and followed the instruction as to how printers of old would revitalize their blocks for optimal condition. When the letters again ‘shone’, as I had dreamt they would, I embarked on the long artistic journey ahead. Day after day, I would return to the photographic studio, trying ‘to make them talk’ to my ‘One Eyed Golem’ (the camera) in endless experimental structures. Knowing in my heart, that once I were to get it right it will justify all expense and effort, I persevered until June 17th 2007 (the first day of Tammuz in the Hebrew calendar). That day, I traveled to the Prudence Cuming photography studios in the West End, straining under the emotional weight that the day marked the anniversary of the death of my late father. He was a truly genuine, kind hearted man who survived alone the war, and had to carry with him the emotional scars of the loss of his first family, and the physical scars resulting from four years of suffering in the most notorious concentration camp, deep in the tunnels of Bor Copper mines. Hanehovim Haneimim Vehayesharim, meaning “The Beloved, The Pleasant, and The Just.” These are the same words that we recite during the Sabbath Av Harahamin prayer (the prayer for the soul of the martyrs). I ventured to photograph this configuration, this time almost unlit, in 130 seconds exposure on optimal 8×10 inch film. When the print was returned from the laboratory just an hour later; there it was. I congratulated the team. However, this miraculous chain of events was followed by another chance meeting, of no lesser importance, with Mr Lee Solomon. Mr Solomon is a dear man, and an expert with unrivaled knowledge of photographic printing. His insight and angelic patience gave the finished work its wood qualities, which truly brought to life my vision. The more praise that The Martyred Letters receives, I am ever more convinced that in one way or another, this work is touched by my martyr father’s fine, honest soul. It was in March 2007 when a dear friend of ours, the wood carver and master framer Louise Liddell, took a brief holiday in Naples. It was there that she walked into a curiosity shop and fell on ‘Freddie the Puppet’. 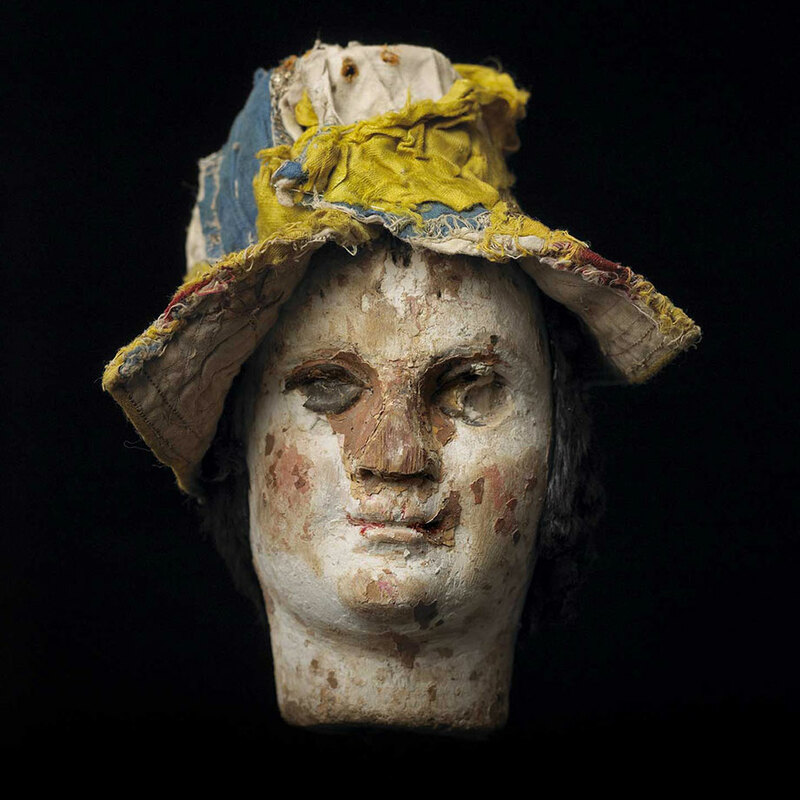 He was laying, head down, buried in a damp, decaying heap of early 19th Century Sicilian puppets. Louise took pity on poor old Freddie. She brought him home to her Newman Street studio, to rest amongst the world’s finest paintings with which she works. My husband and I became enthusiastic admirers of Louise’s ancient, punished puppet. So when Louise offered to bring him to my studio so I might photograph him, I seized the opportunity. My current preoccupation then began. I had to learn and unlearn a great deal to capture Freddie’s remarkable quality. But I was driven, as by an inner need, to prove the grace and charm overlooked by those who destined our dear Freddie to the heap as uninteresting and worthless. I was still experimenting when the remainder of his charming cast arrived in the town. The project has thus grown into a full year of work, which I may well mark as my puppet year. The images I present here bear the mark of a most unlikely combination of culture, age, fashion and discipline. They also represent a progression in my work, exploring moods of photography, from playful glances to probing gazes. All along i rely on the viewer to grace my endeavour with a special meaning. Through my lens, Freddie and his friends are more than puppets alone. They have a story to tell and a life beyond their surface appearance. It is that spirit that I hope the images capture.